Some people have too much time on their hands, but what with the recession, it’s slightly more understandable. 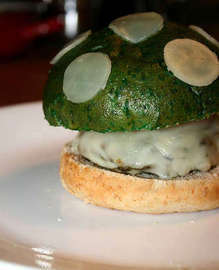 Learn how to make your own Mario mushroom burger here.. I can’t decide if this is genius or grotesque, but it would certainly show off your geek credentials. If you eat this do you get an extra life? More realistic would be a red-top burger, as if you ate too many of those you’d definitely get bigger!